NASA’s Hubble Space Telescope is back dropped by the horizon of the blue and white Earth and the blackness of space. Engineers have pulled together a shopping list of items to maintain the observatory’s health prior to a hoped for in-space servicing makeover. Tokeep the Hubble Space Telescope going, officials are changing how it operatesand contemplating other actions for the aging observatory. Engineersrecently shutdown one of the orbiting observatory's three operational gyroscopes in aneffort to preserve the operating life of the third gyro, thereby pushing Hubble'sscience observations into mid-2008. Otherlife-extension ideas are being studied - even downshifting Hubble onto one-gyromode. Scientistsand engineers remain hopeful that the telescope will once again get a servicingmakeover by astronauts. But such a shuttle mission depends on the health ofthat human spaceflight program. The shuttle is headed for retirement in 2010,with a vaguely defined Crew Exploration Vehicle to be its replacement.Meanwhile, it is not clear when the nextflight will take place nor whether a trip to Hubble will be possible. KeepingHubble alive and scientifically valuable has become a race against the clock thatinvolves aging hardware and dwindling battery life while solar activity thateats away at satellite's orbit -- and of course, budget considerations. Hubblepacks six gyroscopes and four free-spinning steering devices called reactionwheels. This hardware is used to point the telescope for observations. 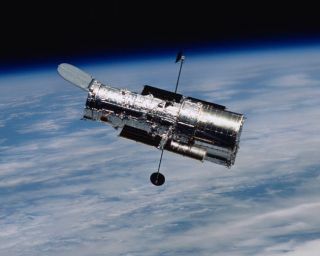 Latelast month, Hubble Space Telescope engineers purposely shut down one of thethree operational gyroscopes aboard the observatory. The system was originallydesigned to operate on three gyros, with another three in reserve. The "two-gyro science mode" is expected to preserve the operating life of thethird gyro and stretch out the telescope's science observations halfway into2008. "Thebest idea for extending life beyond two gyros is to get up there with theshuttle and service it. And that's what we're working on," said Preston Burch,program manager for the Hubble Space Telescope at NASA's Goddard Space FlightCenter in Greenbelt, Maryland. Whilesuch a mission is not manifested for the shuttle program at the moment, Burchsaid his program is shooting for a Hubble servicing mission in December 2007.Preliminary discussions, he told SPACE.com, also point to shuttleAtlantis being tapped for that servicing stopover. WideField Camera 3 that sees in both infrared and ultraviolet wavelengths and farmore sensitive in the infrared than Hubble's Near Infrared Camera andMulti-Object Spectrometer (NICMOS). CosmicOrigins Spectrograph that is capable of studying the chemical composition offar-distant interstellar gas and replaces Corrective Optics Space TelescopeAxial Replacement (COSTAR) hardware. "Whatmakes Hubble worthwhile," Burch said, "is putting in new science instrumentsthat have state-of-the-art detectors to really make the leaps forward...what wecall the 'science discovery factor.' Those are the things that are really goingto make Hubble a useful and desirable space research vehicle beyond the 2008time frame." AHubble Servicing Mission 4 would have the visiting shuttle crew also boostHubble into a higher orbit, replace a fine-guidance sensor, and placeprotective material on top of torn insulation. Meanwhile,Hubble engineers have scoped out a non-shuttle priority list of things to dothat can maintain the telescope's well-being. There's a list of roughly twodozen items that would be worth considering, Burch said. After the Columbiaaccident, he added, a Hubble life-extension initiatives program was put intoforce. Thetwo-gyro science mode was at the top of that list. New pointing algorithms hadto be developed. Simulations were done on the ground to prove the ideaworkable. Then the concept was tested on Hubble itself. "Itworked far better than we had expected," Burch said. Now, both government andindustry teams are looking at the feasibility of a one-gyro science mode. "Thatcould be very key in terms of keeping the science going if a shuttle[servicing] launch date drifts to the right a lot," he added, say until late 2008or perhaps early 2009. Otherlife enhancing thoughts include tracking the number of cycles on Hubbletransmitters and hours of operational use. Akey to Hubble's endurance run are rechargeable nickel-hydrogen batteries,energized by the observatory's solar panels. The telescope has its originalbatteries. They date back to 1990 and are deteriorating in power levels withage. When the batteries are no longer able to hold a charge, Hubble becomesinoperable. Burchsaid that a Hubble battery test bed at NASA's Marshall Space Flight Center inHuntsville, Alabama is helping to forecast battery lifetime. That test rig usesone of the Hubble flight-rated battery spares to assess power trends. OtherHubble-unique facilities try different charging and energy management schemes,he said. "Theprojected life of Hubble batteries has been extended. We used to say we thoughtthey were good until 2008-2009. Now we're thinking 2010," Burch said. "We thinkHubble will remain serviceable until well into 2010...based on latest projectionsand test data we have." Howproductive Hubble will be at that time from a science perspective is adifferent matter. "That'sdriven principally by the gyros. And right now, we're saying we think we'regood until the middle of 2008," Burch said. "Hubble will still be worthservicing as long as the batteries hold out." Withthe stretch out of Hubble servicing via shuttle astronauts, the vigor of thetelescope's batteries and gyros are central to extending the observatory'slife. Goingto the two-gyro science mode is great news, said James Crocker, vice presidentof civil space programs at Lockheed Martin Space Systems Company near Denver,Colorado. The firm is part of an on-going industry and government partnershipto keep Hubble alive and well. "Theteam is used to doing miracles," Crocker told SPACE.com. The placing ofone gyro into storage and saving it was a well-researched and tested plan. Asfor the gyro, he added: "When it's running, it is wearing. When it is off, it'snot." Moreover,Hubble batteries are also a source of good news. "They are not degrading asfast as we had feared," Crocker said. Also, past experience with batteries inspace suggest that they tend to degrade gracefully, he said, perhaps allowinguse of select Hubble instruments instead of all of them at some point. TheHubble operating and servicing team has been a steady-state activity since theobservatory was shuttle-deployed in 1990. "Peopleare constantly pulling rabbits out of the hat. Hubble is like working in thecathedral. There's a very dedicated group of people who just aren't going tolet Hubble go quietly in the night," Crocker said. Crockersaid that NASA chief, Michael Griffin, has the Hubble team marching toward ashuttle servicing mission - given a couple of good shuttle flights. "From anexecution point of view, we're continuing to hold the option open," he said,"and we're doing all the steps that we need to do to be ready to go." GivenHubble's batteries and the gyro fixes, "I think we've got a nice window" forshuttle servicing, Crocker added, probably no sooner than December 2007 - witha goal of perhaps pulling it in a few months earlier if necessary. "Everythingis being done to get shuttle back into a position where it can service thespace station and Hubble," Crocker explained. Meanwhile,work on a Hubble deorbit modulehas been cancelled, Burch said, a task that was underway at Lockheed Martin. A"Dear Lockheed letter" advising of the stop work on the deorbit module wasdated Sept. 2, Burch said. However, that communique also called for "partialtermination" of some related work by the company. Thecontract was not totally cancelled, Burch noted. Lockheed Martin expertise isbeing requested for both sensor technology ideas and an attachment fixture tobe outfitted to Hubble. This fixture could be secured to the telescope byeither astronauts or by a robotic mission, he said. "Wethought it smart to do something while we're up there to make it a lot easierto rendezvous with and grapple Hubble for deorbiting," Burch said. That might beaccomplished by either the Crew Exploration Vehicle meant to replace theshuttle, or by robotic means, he noted. Furthermore,quite a bit of work had been done by Lockheed Martin on the Hubble deorbitmodule. The company has been informed that all propulsion hardware that is 75percent complete or greater should be wrapped up and turned over to the LunarReconnaissance Orbiter (LRO) project. "Scrappinghardware that is three-quarters complete is, I think, sinful," Burch said. Sothe plan is to use deorbit module-related valves, thrusters, and other itemsfor the Goddard Space Flight Center-managed LRO project, he said, with the LROoffice reimbursing the Hubble project for that hardware. "Insteadof [LRO] building from scratch and having all of our stuff wind up in a scrappile, we thought that this made some sense," Burch said. Atsome point in the future, Hubble will meet its ultimate fate - taking adestructive dive into the Earth's atmosphere by natural forces or undercontrolled ditching. Thetelescope is not likely to fall back to Earth on its own prior to 2020,according to Nicholas Johnson, NASA Orbital Debris Program Manager and ChiefScientist for Orbital Debris at the NASA Johnson Space Center in Houston,Texas. Thetelescope's reentry could happen a few years earlier, but that depends on theSun's activity in future years, Johnson said. Increased output from the Sun expandsthe Earth's atmosphere. That creates added drag on Hubble and will hasten its fallfrom orbit. Johnsonsaid if another servicing mission is carried out, Hubble would likely be givena small boost in altitude before the shuttle departs the scene. This wouldfurther delay a natural reentry of the telescope, he explained. Burchof Goddard Space Flight Center said that a very conservative estimate ofHubble's reentry is 2021. Other models predict a historically low solar cycle,putting an on-its-own tumble of the telescope to Earth in 2025, he said, andperhaps out to 2030. "Ithink two more decades of flight is a real possibility for Hubble," Burchadvised. "The biggest unknown is how long Hubble is going to live...to continueto produce useful science.